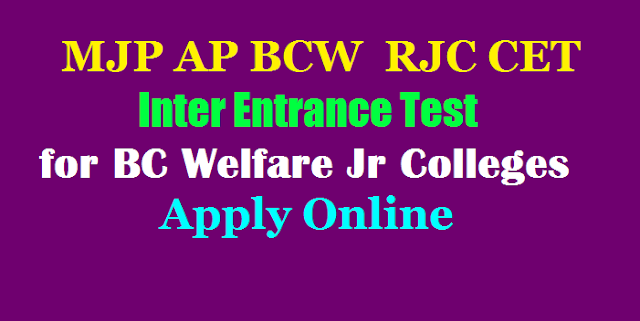 MJP AP BCWRJC CET 2019 RJC Inter Entrance Test for BC Welfare Jr Colleges by APREIS Apply Online at aprjdc.apcfss.in : Andhra Pradesh BC Residential Junior Colleges Common Entrance Test which also known as BCWRJC RJC 2019 notification and examination details has been announced by Andhra Pradesh Residential Educational Institution Society (APREIS), Hyderabad on behalf of Government of AP for admission to Intermediate courses like MPC/ Bi.P.C/ MEC/ CEC in Residential Junior Colleges in AP State for the academic year 2019-2020. Applications are invited from candidates who intend to take admissions into Inter First year in AP Residential Junior Colleges for the academic year 2019-2020. The application process for the MJP Andhra Pradesh (AP) BC Welfare Residential Junior College Common Entrance Test (MJP AP BCWRJC CET) has started. The candidates who want to apply online can do so through the official website, aprjdc.apcfss.in. The online application process has been started from March 14, 2019. The last date to apply online is April 14. the MJP APBCWRJC CET Entrance examinations will be conducted on May 9, 2019. MJP AP BC Welfare RJC CET 2019 - MJP AP BC Welfare RJC Inter Entrance Test AP BC Gurukul RJC CET 2019, How to Apply Online at aprjdc.apcfss.in MJP AP BCWRJC CET 2019 Notification, Online Application,Exam dates, Eligibility Criteria , hall tickets, results and more details givrn in this page. 1. The test is of objective type with 2½ hrs duration for 150 marks (50 marks for each subject). 2. The candidates have to mark their answers in the OMR sheets. 3. The question papers of APRJC CET will be based on 10th standard in AP state syllabus for subjects and English will be General English. a. Candidates can download their Hall Tickets from the website at http://aprjdc.apcfss.in from 01.05.2019 to 08.05.2019 with the reference number allotted to them. b. Candidates have to download the hall tickets from the website only. No printed hall ticket shall be issued/posted to the candidate. c. Request for issue of duplicate Hall Ticket will not be entertained. d. Without hall ticket, no candidate will be allowed to appear for the examination. 1 . The candidates are personally held responsible for incorrect information in the application form. 2. The convener reserves the right to cancel the admission at any stage, if the particulars furnished by the candidate are found incorrect or against the rules of admissions. iv. If there is a tie between male and female candidates, then female candidate shall be given higher rank. Admissions: Admission will be made through counseling. First counseling for admission will be placed after 01.06.2019. Exam date : MJP AP BCWRJC CET 2019 Entrance Exam: 9th May 2019.